Titian’s David and Goliath (1542-44) in Venice’s Basilica Santa Maria della Salute was damaged by water when firefighters soaked the roof while fighting a fire in the seminary next door. David and Goliath was displayed on the ceiling of the basilica’s sacristy along with 2 other works by Titian (Abraham and Isaac and Cain and Abel). 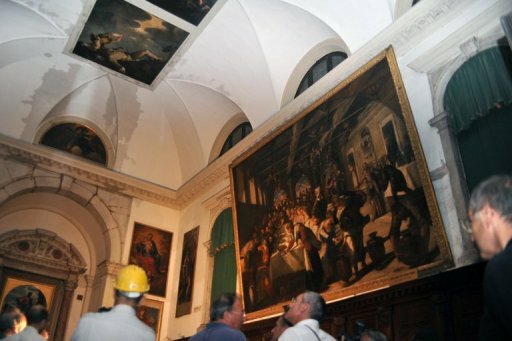 “I saw water dripping from the painting for an hour” after the fire at an adjacent construction site was put out late on Sunday, the head of Venice’s museum agency Vittorio Sgarbi told AFP, adding that he rushed to the scene after seeing the fire while dining at a nearby restaurant. Workers have erected scaffolding to inspect the damaged “David and Goliath” along with two other Titians that look down from the ceiling of Santa Maria della Salute’s vestry. “The painting might have experienced some alteration, but nothing that can’t be restored,” said Sgarbi, a well-known art critic. David and Goliath was restored 20 years ago. It’s that recent restoration work that is most likely to have been affected by the water. Restorers nowadays use “reversible” colors to ensure that they don’t fall into the trap of past restorations that ended up materially altering the original canvas. That makes them easy to remove in case they’ve made a mistake without needing to use any harsh solvents that might damage the original brushstrokes. That also makes them more susceptible to external elements like, oh, say, gallons of water from firefighter hoses, but by design they’re easy to repair so that’s why Sgarbi doesn’t sound too upset. There are several other Titian paintings in the vestry of the basilica (8 tondi of the Doctors of the Church and the Evangelists) which may have been damaged when the sprinkler system went off in response to the fire next door. Any damage that may have occurred isn’t immediately obvious. They will all be carefully examined and repaired as necessary. Santa Maria della Salute (Saint Mary of Health) was built in 1631 as a votive offering to the Virgin Mary, considered the protector of the Venetian Republic, to end the devastating plague of 1630.